The Asko Appliances team of James Dorron, Paul Montague and John Walton produced an outstanding performance to win Race 3 of the NSW 18ft Skiff Championship on Sydney Harbour today. A perfect summer day, a 15knots North-East breeze provided the setting for a sensational race which ‘had it all’. Extremely close racing and a few incidents gave the spectator fleet plenty to cheer about before Asko Appliances finally crossed the finish line a 20s winner from Finport Trade Finance (Keagan York, Lochy Gilmore, Greg Dixon) after the pair had fought for the lead throughout the entire race. Triple M (James Ward, Adam Gillson, Huon Oliver) was a further 1m30s back in third place after another solid performance. Rag & Famish Hotel (Bryce Edwards) finsihed fourth, followed by Appliancesonline.com.au (Brett Van Munster) and Noakes Youth (Kirk Mitchell). Series leader and defending champion, Smeg (Lee Knapton) had a disappointing day with an incident requiring a penalty turn, then a later capsize, sending the skiff back into seventh place. Despite the disappointing day, Smeg still leads the championship on 9 points, followed by today’s winner Asko Appliances on 16 points, Noakes Youth on 16 points, Triple M on 17, Rag & Famish Hotel on 17 and The Kitchen Maker (Scott Babbage) on 19. Right from the start, the race developed into a battle between Finport Trade Finance, Asko Appliances and Smeg, with a group including Yandoo (John Winning), The Kitchen Maker, Rag & Famish Hotel, Appliancesonline and De’Longhi (Simon Nearn) close behind. A collision between Smeg and The Kitchen Maker midway up the windward leg ruined the chances of both teams and allowed Finport and Asko Appliances to extend their lead over the challengers at the Beashel Buoy. 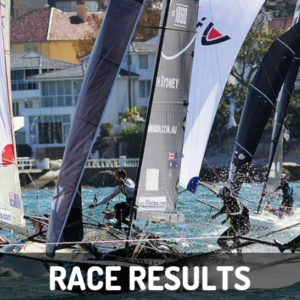 Both skiffs went around the mark together and produced a thrilling race downwind to the wing mark off Shark Island while Yandoo, Appliancesonline and Triple M were also charging and reduced the margin between them and the two leaders. The spinnaker run between Shark and Clark Islands was a thriller and only 15s separated the leader, Asko Appliances, from Finport and Appliancesonline. Yandoo, Triple M, De’Longhi and Smeg (which had made a good recovery) wer closely bunched before a capsize sent Smeg out of contention. Asko team’s performance on the second windward leg back to the Beashel Buoy was again brilliant as the team increased their leading margin from 15s to 35s over Finport. Yandoo had also sailed a great leg and was third, ahead of Triple M and Appliancesonline, but a broken halyard on the following spinnaker run all but ended Yandoo’s hopes of finishing in the top group. Over the final lap of the course, Finport clawed back some of Asko’s lead and only 15s separated the pair again when spinnakers were set at the Beashel Buoy. The two skiffs were side by side as they raced to the south end of Shark Island wing mark and now only 10s was between them as they began the race between the islands to the finish. Asko’s crew held their nerve and Asko Appliances actually increased the margin to complete a wonderful race. 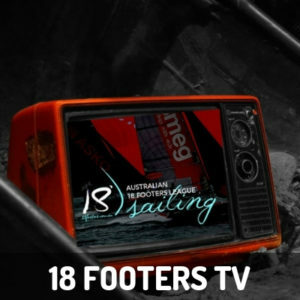 The Australian 18 Footers League’s 2017-2018 Season will now go into recess for the Christmas/New Year period. Race 4 of the NSW Championship will be sailed on Sunday 14 January. 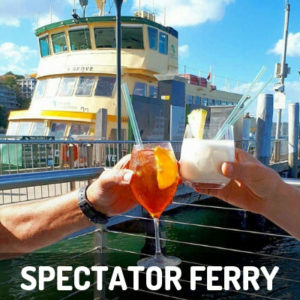 The Spectator Ferry follow the remainder of the NSW Championship, leaving Double Bay Public Wharf, alongside the clubhouse at 2pm. 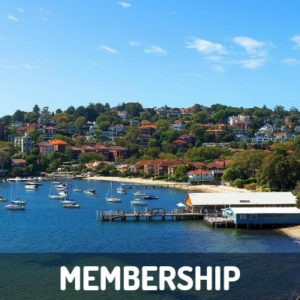 The season’s highlight, the JJ GILTINAN CHAMPIONSHIP will be sailed from 3-11 March 2018.